When it comes to gourmet beef jerky, the House of Jerky brand is one that comes to my mind. I've always enjoyed this brand for years, but haven't purchased much of it, probably due to the fact that you don't find this in the large grocery store chains. But when I'm out touring around other towns, and happen to see a beef jerky shop, I'll walk in, and 9 times out of 10 its an outlet for House of Jerky. The brand is very well represented in those small touristy towns, and along roadside stands. The company is a husband and wife venture that got started here in Southern California, and sadly enough, moved to Indiana to set up its national headquarters. Nothing against Indiana, it seems California can't keep a good company within its borders. Beef (top round), teriyaki sauce, brown sugar, honey, pineapple juice, water, liquid smoke, black pepper, garlic powder, ginger powder. Probably the first thing that hits my taste buds is a combination of sweet, and the natural meat flavors. 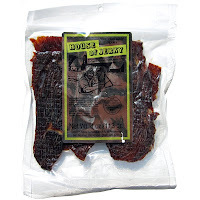 House of Jerky seems to do a very good job of bringing out the natural meat flavors in all of its varieties, and this is no exception. There is indeed a teriyaki flavor here, but this particular combination of soy sauce and sugar seems to be more heavily weighted on the sugar side. The final flavor that comes out in this variety is the ginger powder, which I find as a pleasant contrast to the sweet. It's almost like having ginger candy, except the ginger flavor is not strong, it's just there as a soft and subtle reminder. There is also some black pepper visible on these pieces, but my taste buds detect only a little of it. It's mostly there for ambiance (if you can have ambiance in taste), and after eating several pieces I can feel the peppery after-taste in my mouth. 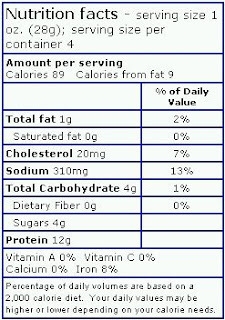 I don't taste much salt in this either, and the nutrition label shows a moderate amount of sodium. 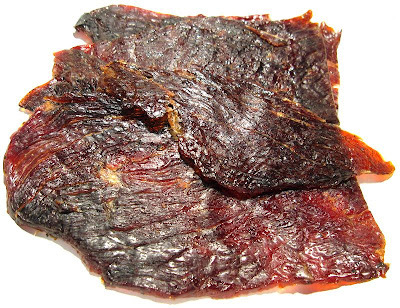 Considering this jerky is made without preservatives, the meat doesn't taste stale at all. Overall, I found this very good. 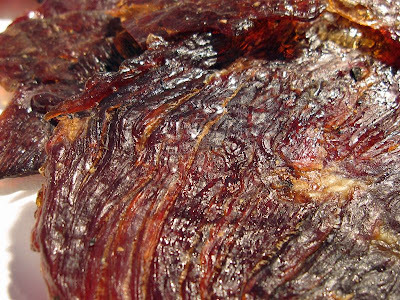 Teriyaki by its nature is sweet, and if you like sweet jerky this has lots. I especially liked the pungent contrast offered by the ginger powder. I was all set to believe that this brand of teriyaki jerky was just going to be plain sweet jerky, but it actually offers some taste-complexity for discriminating jerky lovers. Let's not forget the natural meat flavor that comes out quite well. These are real cuts of meat, sliced thin to medium thickness, and in small, medium, and large sizes. The meat is largely on the dry side, but with a thick layer of sticky-sweetness that gives it a moist appearance. It's sticky enough that you'll lick your fingers. This also requires some moderate effort to tear apart and chew. You'll do better by softening up a piece in your mouth, sucking out some juices, and then chewing. They're also very lean, I didn't find much fat at all in here. No pieces of tendon or gristle. Overall, the meat consistency offers a decent beef jerky experience. While it requires some effort to tear this apart and chew, and will leave you licking your fingers each time, it doesn't detract too much from the overall enjoyment of the flavors. I'm starting to sound a broken record, having given House of Jerky so many "best" ratings already. I tried to be as truthful as I could for my readers, and I do in fact consider this brand of teriyaki jerky to be that good. You get plenty of sweet teriyaki flavor, a great contrast in the ginger powder, with some additional contrast in black pepper, and then all wrapped around a natural beef taste that comes out well. It would be icing on the cake if they could make this a little more easy to tear and chew, but it's not that bad enough to knock this down a notch. The teriyaki beef jerkey from House of Jerky is the best jerky I've ever eaten. It has the perfect blend of seasonings (a little bit sweet--just how I like it) and it is very moist and chewy. Overall: delicious!